There are actually a number of issues that people may have some fundamental misunderstandings or misconceptions about. Below is a list that gives some of the common misconceptions. However, keep in mind that this is by no means an exhaustive list, and only shows some of the issues. Some people think that if velocity is constant, then acceleration is, too. That is wrong. If there is no change in velocity, there is no acceleration. Similarly, high velocity doesn't denote high acceleration, and low velocity doesn't denote low acceleration. At the same time, however, some people may think that if speed is constant, then acceleration is zero. But that's not the case, as speed is only the magnitude of velocity, and doesn't take into account acceleration. So consider, an object orbiting another at a constant speed, the speed is consistent, but the velocity is constantly changing (due to changing direction), so there is indeed acceleration. Perhaps the most confusing is the idea of negative acceleration. However, we must remember that the negative sign has a physical meaning: to show the direction of the vector quantities. With this in mind, we must realize that positive acceleration doesn't necessarily mean the object is speeding up, but is simply accelerating in a positive direction, and that negative acceleration doesn't have to mean the object is slowing down, but is simply accelerating in a negative direction (consider speeding up in a negative direction). Another misconception that people might have is that gravity may be different for different objects. This is not true. Gravitational acceleration holds true and constant for all objects. 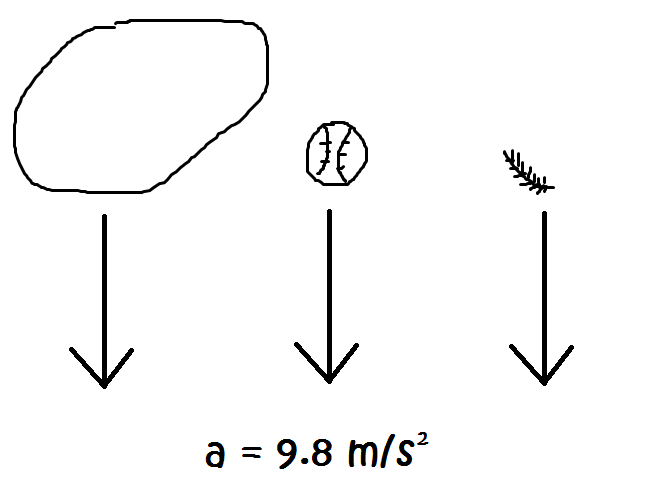 The perceived difference in the different speeds that objects fall is accounted for by things like drag, friction, and air resistance (all of which are essentially the same in this case). In an ideal environment with no air, all objects actually fall at the same speed; be it a boulder, a baseball, or a feather.